January | 2012 | Feast! St. Basil the Great was a 4th century monk who became bishop of Caesarea. He is a Doctor of the Church, wrote extensively on the Holy Spirit and established rules for monasticism that greatly influenced the Rule of St. Benedict. To celebrate St. Basil’s Day, we made Lakror, an Albanian meat pie traditional for St. Basil’s Day, with a simple salad of baby greens from our garden. Saute onion and garlic in oil, butter, or, if you love bacon like we do…bacon grease. Yum. Add meat, salt, oregano, and pepper. Cook until meat is browned then drain the fat. Combine parsley, rice, and eggs and add to meat/onion mixture. Grease a 9/12 pan. Line bottom of pan with one layer of phyllo dough. Brush with butter and then add another layer. 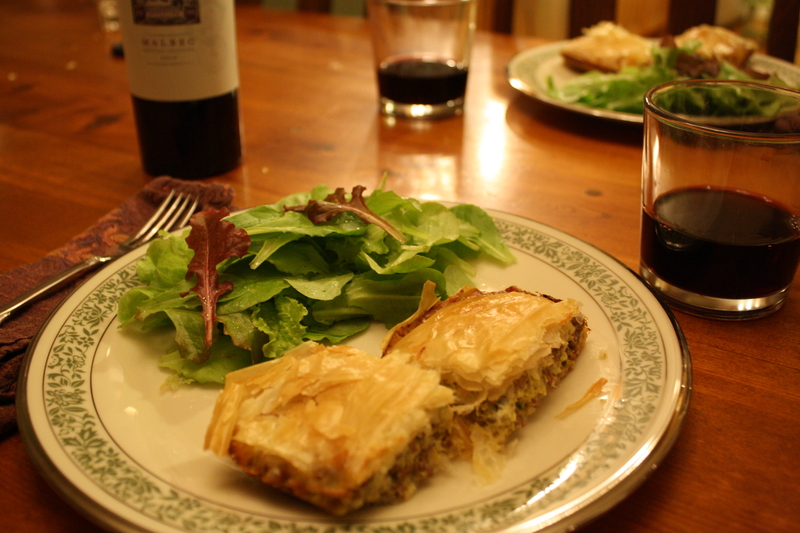 Repeat until you have 10 layers of phyllo and butter. Add meat filling to pan and spread evenly. Cover with 10 more layers of phyllo and butter. Score the top layers of phyllo with a knife before cooking. This will make it easier to cut after it cooks. Bake at 375 until golden brown (it took 35 minutes for ours). Serve with simple salad, rice, and a bottle of Malbec. Even before I became Catholic I’ve always loved St. Lucy’s Day. The Feast of St. Lucy (whose name means ‘light’) takes place during the darkest time of the year and is a bright spot during the dark, cold days of Advent. This brave saint was an early 4th century martyr from Sicily. When St. Lucy refused to wed a pagan and, desiring to remain a virgin, gave away her dowry to the poor, the man who wanted to marry her turned her in for being a Christian. 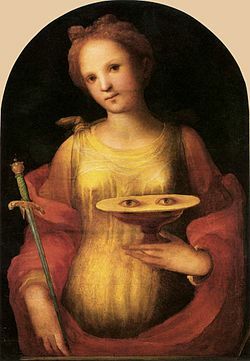 Her eyes were plucked out and yet God restored her sight miraculously (this is why she is often portrayed holding her eyes on a plate and why she is the patron saint of the blind). When her torturers tried to burn her, her body would not burn and when they attempted to drag her to a brothel, her body was immovable. 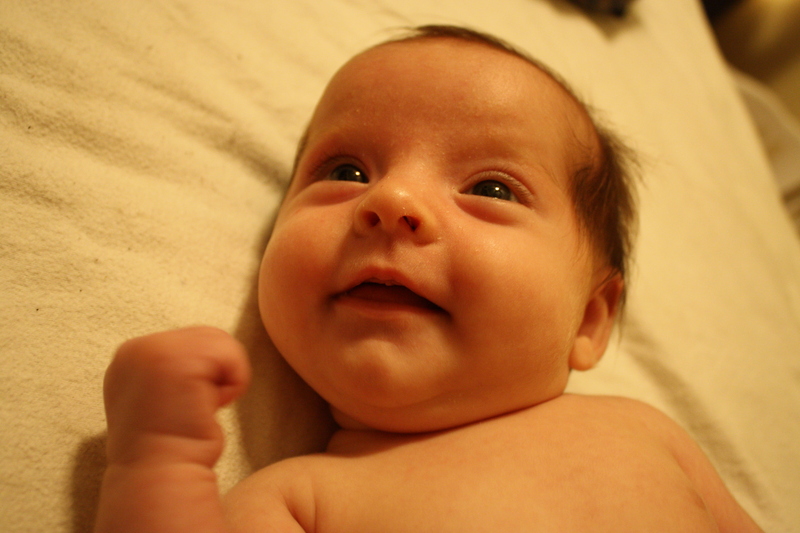 She was finally martyred when stabbed in the throat. See? Anyhow. 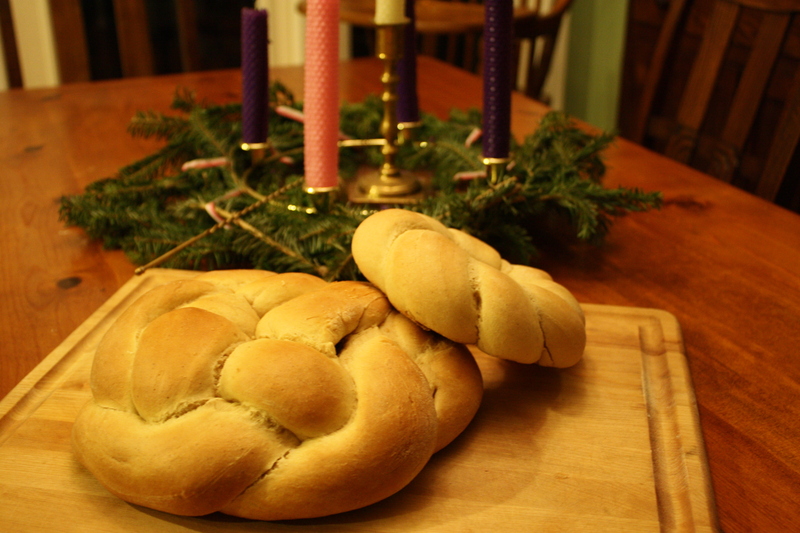 Daniel made a Santa Lucia Bread Crown, a traditional Swedish way to celebrate St. Lucy’s Day. 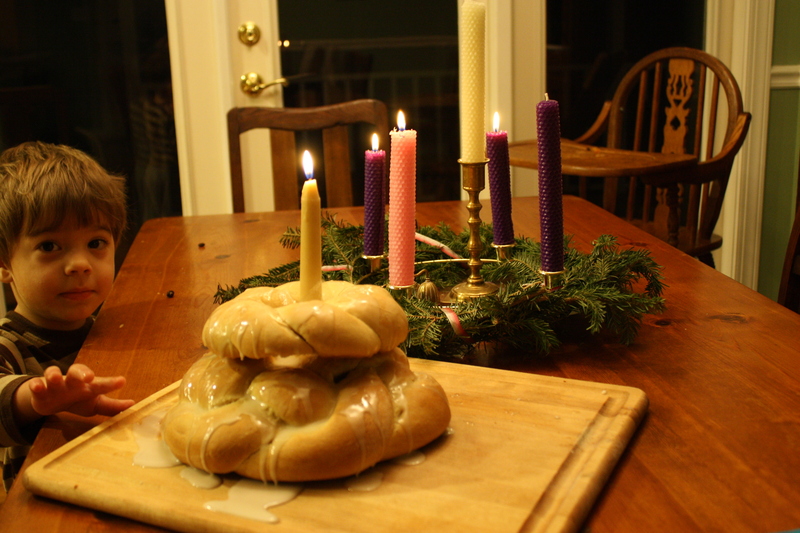 He modified a recipe from Cooking with the Saints which turned out just fine, but he says that next year he will just do a similar style braided crown using cinnamon roll dough. This recipe wasn’t as sweet and moist as it could have been. Pour 1/4 of the warm water into a large bowl. Add yeast and stir until dissolved. Add the other 1/4 cup of water, milk, sugar, butter, salt, spices, and 2 cups of the flour and blend. Add 2 eggs and remaining flour. Knead on floured surface approx 8 minutes. Place in greased bowl and cover until it doubled in size (approx. 1 hr). Punch down dough and remove to floured surface. Separate dough for top of crown (1/3) and the larger bottom of crown (2/3). Divide the 2/3 of dough into 3 pieces, roll them, and braid into a rope, form circle and pinch ends to seal. Set on greased baking sheet. Repeat braiding with the remaining 1/3 of dough. Cover braids and let rise 1 hour, or until they double. Beat remaining egg and brush onto bread. Bake at 375 for 15 min and remove smaller braid. Cover larger braid in foil and bake for another 10 minutes. Combine ingredients for icing and ice the cooled braids after stacking them. Beware that sneaky toddlers don’t stick their fingers in the icing.